Nowhere but in Spain does simply clapping my hands give me performance anxiety. That’s because in Spain, more than any place else I know, clapping to music is an art. You notice it right away when you listen to flamenco or other traditional Spanish music: an exotic, staccato beat that follows a rhythm that’s not quite Western…not quite what our ears are used to—or that our hands can clap. It’s a sound that conjures up another world: the muezzin in his tower, the souk, the sweep of desert winds, the whirl of gypsy skirts. It’s a sound that you must grow up hearing in your bones if you want to convey it well. 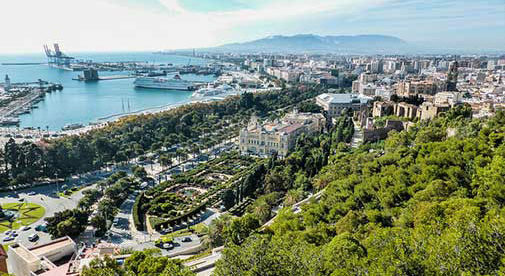 To enjoy many worlds and times in a single place, come to Spain. Sit in an Andalusian bar, as I have done, listening to local musicians, and the modern world outside can melt away. Gone are the honking horns and idle chatter of 21st-century life. Instead, inside, you’re surrounded by tradition: tile walls in designs that are a millennium old; dry sherry, crisp and cold, served in narrow glasses from casks of dark, aged oak; succulent dishes redolent of garlic and swimming in rich, green olive oil, the smell wafting up to you from the dark-red, earthenware bowl. 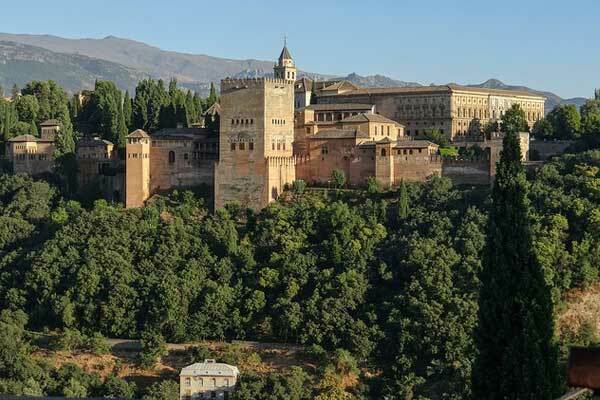 Glynna photographed this view of the Alhambra, possibly from near where the sultan viewed it. In Cordoba, once one of Europe’s most powerful cities, gaze at the mighty Roman bridge reflected in the waters of the Rio Guadalquivir; stand amid the red-and-cream horseshoe arches of Cordoba’s mosque, it’s cool walls a sanctuary from the southern Spanish heat. Or look out at the 2,000-year-old Roman theater in Malaga, at the heart of the Costa del Sol, from an umbrella-covered table at the popular Bodega Bar El Pimpi. Sip a flinty white wine from nearby Cadiz—like Malaga, founded by the Phoenicians—over lunch and end with a copa of Malaga’s sweet dessert wine; a glass of the heavy, amber-gold liquid will run you $2.30 or less. Not all of Andalucia’s history is ancient. In Jerez de la Frontera, the heart of Spain’s sherry triangle, the past definitely lives in the present. This city’s culture rests on three pillars: horse-breeding and training, sherry production, and flamenco. I’ve sipped sherry from a local bodega (Domecq and Gonzalez Byass are both based here) while listening to flamenco in the city’s many tabancos—traditional sherry bars. I’ve watched magnificent, dressage-trained horses prance and pirouette in the city’s famed Royal Andalusian School of Equestrian Art…though my favorite memory is watching a pure-white stallion, his rider dressed in the classic flat hat and buff trousers of an Andalusian nobleman, dance delicately across the sandy beach in nearby El Puerto de Santa Maria. Spain is a First-World country, with all the modern conveniences you’d want. But its rich past still lives…especially in many smaller, affordable cities like Jerez, Granada, even Malaga. A couple can live well in many towns here on $2,600 a month, including rent…eat out for less than $30 (and you’ll want to because the food is amazing)…and travel the country by rail or bus at discount rates. Though Spain’s real estate slump is officially over, bargains are still around. Throw in Andalucia’s amazing Mediterranean weather, where on the coast even winter days average temperatures around 60 F…and the varied terrain, where snow-capped peaks for hiking and skiing lie mere hours from the beach…and it adds up to some of the best value for money in Europe right now. So, come to Spain and savor the rich history, charming people, and colorful culture—and who knows, in time, you may even learn to clap to its beat.